Un Hui’s back bent without resistance when Cho Ryu Hyang caught his fall. Cho Ryu Hyang felt his heart drop when he saw how powerless Un Hui was. Un Hui opened his eyes slowly when he heard Cho Ryu Hyang say his name. Cho Ryu Hyang couldn’t say anything. Un Hui smiled after seeing this. Un Hui closed his eyes again. Cho Ryu Hyang tried shaking him a few times but it was all in vain. Cho Ryu Hyang trembled as he looked at this. Right now, Un Hui was spewing blood out of his nose and mouth continuously. When Cho Ryu Hyang saw this, he was instantly reminded of Jo Gi Chun’s last moments. The same thing that was happening with Un Hui occurred at the moment of his teacher’s death, which resulted in causing Cho Ryu Hyang’s heart to beat faster and faster. It was beginning to get hard to breathe. It felt like he was falling to the deepest part of hell. The word that his teacher said to him rang in his mind. Cho Ryu Hyang responded sharply to this voice. Even whilst trembling violently from shock, he tried his utmost to check Un Hui’s condition. What truly made Un Hui this sick. It was the injury in his waist. Anyone could see that the wound was fatal. Cho Ryu Hyang’s normally calm eyes began to redden. He looked back up and glared. In front of him was Gu Hui. Their eyes met once again in the air. Surprisingly enough, the one to speak first was Gu Hui. Gu Hui’s entire body was filled with sweat, and this sweat all turned to steam as soon as it came out. He, too, had expended an immense amount of energy from this. After all, he managed to shatter that little boy’s pride. If that were the case, then Gu Hui would’ve been the one to fall first. Gu Hui pushed that thought aside for now and looked at Cho Ryu Hyang. Cho Ryu Hyang turned away from Gu Hui, then immediately looked to Un Hui. He was trying to find something. He was able to find the pills he needed for emergency care immediately. Un Hui had carried many pills with him at all times out of caution. Cho Ryu Hyang remembered this, and he also remembered what types of pills Un Hui carried with him. Cho Ryu Hyang opened the container Un Hui had treasured most and took out a small pill from it. It was a pill that Un Hui had kept for Cho Ryu Hyang’s personal use. Cho Ryu Hyang took it out immediately and put it into Un Hui’s mouth. Cho Ryu Hyang bit his lower lip. He kept his fingers in Un Hui’s mouth, holding the pill down in case Un Hui tried to cough it out. After a moment, Cho Ryu Hyang took out his finger and ripped a bit of his cloth off. Gu Hui was watching him from a distance, but that didn’t matter. Right now, Un Hui’s life was what mattered most. It didn’t even matter if Gu Hui were to use this time to destroy the formation. The first time Cho Ryu Hyang saw someone die, he couldn’t do anything about it. At the time, he was powerless and didn’t have the ability to do anything. In fact, did he not almost go insane from his powerlessness? Right now, he was different from his past. Right now, he actually had the power to do something. Because he knew this, Cho Ryu Hyang worked like a madman. His body became dyed in Un Hui’s blood as he worked, but that did not matter. Cho Ryu Hyang applied the medicine on Un Hui’s injury and wrapped the wound with the fabric on his hand. Then, he carefully observed Un Hui’s situation. At the same time, he was afraid. He had done everything that he could. He could only wait now. But if that didn’t work? Cho Ryu Hyang’s eyes shook with fear. If something happened to Un Hui as a result of his arrogance, Cho Ryu Hyang wouldn’t be able to bear his regret. Cho Ryu Hyang’s face became painted with impatience. Cho Ryu Hyang carefully put his finger on Un Hui’s nose. Cho Ryu Hyang fell down on the floor. Thankfully, the medicine did have an effect. Un Hui’s breathing had gotten much smoother than before. After checking on Un Hui several times, Cho Ryu Hyang put his hands down on the floor with an exhausted face. He then turned to Gu Hui and flashed his eyes. Gu Hui made a regretful face. He had tried to break through the formation while the child was distracted, but he had failed. Cho Ryu Hyang opened his mouth. Cho Ryu Hyang fixed his glasses. His fingers that were on his glasses were trembling slightly. Cho Ryu Hyang’s words had a different meaning to what he had said just now. Gu Hui became curious of what the boy meant. Cho Ryu Hyang didn’t respond any further and put his outer clothes down on the floor. He then put Un Hui’s body on those clothes. Once Cho Ryu Hyang disappeared from plain sight, Gu Hui began to carefully search the area around him. He didn’t have a good feeling about this. Lim Hak Gyum showed himself from the shadows and approached Gongson Ahri. Gongson Ahri became extremely surprised by Lim Hak Gyum but sighed once she realized that it was a familiar face. Gongson Ahri walked over to Lim Hak Gyum and asked him a question. Lim Hak Gyum grinned when he saw Gongson Ahri ask about Cho Ryu Hyang and opened his mouth. Lim Hak Gyum spoke with a smile on his face, but in reality, he was a nervous mess. According to his sources, the people inside the formation were all the real deal. The ones that were actually hard to take out weren’t coming out of the formation. It would be much better if the strong ones got out one by one so that they could take them out, but… it wasn’t easy. Plus, the ones that got dragged out of the formation were all from the Alliance. They were plenty annoying as well, but compared to the ones that are still inside, they were a child’s game. Lim Hak Gyum let out a sigh. At this time, No Jin Nyung, who had been roaming the edges of the formation with a nervous face, felt a presence near him and turned around. A white rabbit was dipping one of its feet into the formation. The rabbit seemed so focused that No Jin Nyung forgot about his worries for Cho Ryu Hyang. Come to think of it, this rabbit was suspicious. Didn’t Cho Ryu Hyang talk to it every once in awhile as well? In the past, No Jin Nyung had thought that there was nothing weird about Cho Ryu Hyang talking to animals since the boy had done pretty strange things in the past. 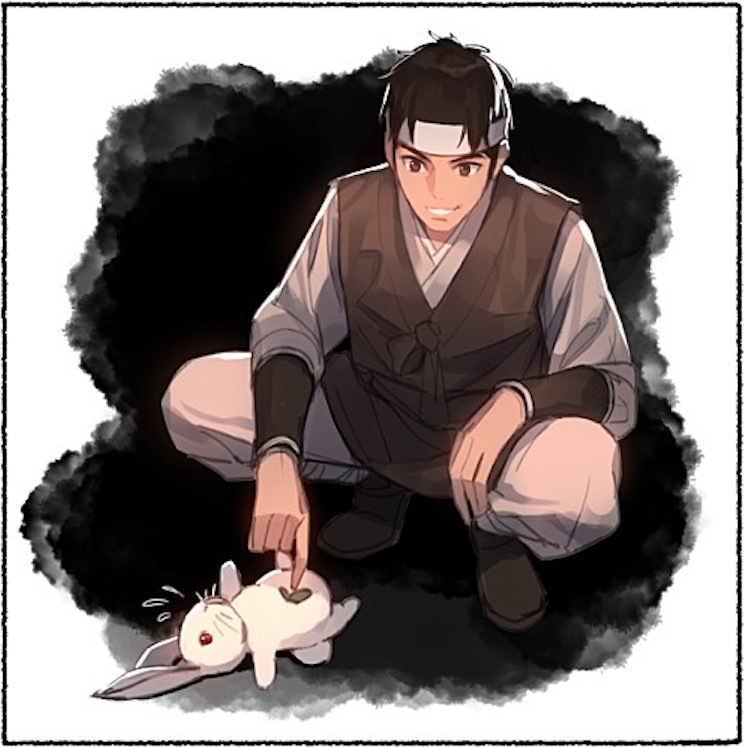 After staring at the rabbit for a while, No Jin Nyung tried touching the rabbit with the tip of his foot. He really didn’t have any reason why he did this. The rabbit’s body got pushed away, and it got disconnected from the formation. The rabbit, Maksu, shot a vicious look at No Jin Nyung. What the hell was the idiot doing? He calmed himself down and put his leg back in the formation. When he did this, he was able to see the insides of the formation. Formations were not his strong point. Actually, he wasn’t even interested in it till now. Cho Ryu Hyang had awakened his interest in formations, and only now was he beginning to explore this new area of study. The picture in his mind disappeared and turned black. Maksu was soon able to find out why. The idiot in front of him. The idiot called No Jin Nyung was looking at him with a dumb grin. Maksu flicked off the dust on his back and stood up. Really, the man was an annoying fellow. Maksu made a strange face when he saw his entire world flip. He had experienced a similar thing before. It was the thing that the annoying girl called Sunwu Cho Rin did to him in the past. When he came back to his senses, he could see that this No Jin Nyung was humiliating him by rubbing his stomach. Just what did the man thought he was? Maksu tried to stand back up frantically, but No Jin Nyung stopped him from doing so with a laugh. When he tried to stand, No Jin Nyung put him down, and when he tried to roll, No Jin Nyung would roll him back over. Maksu glared at No Jin Nyung fiercely. Seeing this, No Jin Nyung flinched. Did he use his strength by accident? That would make him break his promise with the kid? Maksu stopped for a second. When he did this, a childlike smile came on No Jin Nyung’s face. No Jin Nyung tapped Maksu’s nose and got back to rubbing the rabbit’s stomach. The leaf on Maksu’s stomach was intriguing him greatly. Maksu frantically tried to run, but it was pointless. The fact that he was unable to show himself pained him. The more Maksu struggled, the more No Jin Nyung bothered Maksu. After a certain time, No Jin Nyung stopped all movements to look at a place next to him. A part of the formation ripped open, and a bloody Cho Ryu Hyang walked out. The smile on No Jin Nyung’s face disappeared in an instant. He moved to Cho Ryu Hyang with a shout. No Jin Nyung’s face was colored with rage. How had he got so hurt? How did he get like this even with that creepy dude next to him? No Jin Nyung, who looked around trying to find a way to let out his anger, made a dejected face after seeing what was on Cho Ryu Hyang’s back. The man was extremely injured. Cho Ryu Hyang passed Un Hui to No Jin Nyung. He then opened his mouth with a chilly face. No Jin Nyung disappeared like the wind with Un Hui in his arms. Cho Ryu Hyang watched No Jin Nyung leave, then turned to the formation after taking out a small pouch. If one sinned, it was only fitting that he got punished for it. That was the law of the world. Cho Ryu Hyang carefully took out the gems in his pouch. Kill them! Kill all of them as revenge for Un Hui! Yeah, kill all of them for hurting your potential hubby. Oh, I was late!!! Sigh*** Didn’t get notification for the new chapter, I’m glad I checked the site. Thanks alot Ensj 🙂 🙂 :). Why did you end in such a cliff!! y u do dis cliff-kun?!?! So now Cho Ryu Hyang, will show why he is the disciple of the strongest Pope so far!!!! !